DS 4208-HC - Safety with everyday convenience! 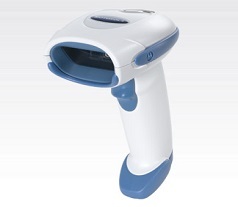 The DS4208-HC can capture 1D and 2D bar codes on wrist bands for patient ID, pharmaceuticals, blood bags, suppositories, syringes for medication administration and specimens for tracking – as well as mobile phone and computer displays. This single affordable and easy-to-use device can error-proof and streamline processes in practically every area of your healthcare facility – from admitting and medication administration to specimen collection, inventory, dietary management and discharge.